Atrial fibrillation is another type of SVT where the abnormal electrical pathway is totally erratic. It is not related to specific wiring defect, but more to abnormally circulating wavefronts passing through the atrial muscle in a scattered manner. It is usually triggered by extra heart beats originating in the veins that connect to the left atrium. In patients with a tendency to cause scattering, the extra heart beats will trigger this erratic rhythm which could be experienced as “irregular palpitations”. An increased tendency to palpitations can occur due to one or more of the following:. the atrium being enlarged or stretched. Imbalances of the body's chemicals such as low potassium. heart muscle damage from heart failure. Secondary to clots on the lung. Attacks may be sporadic and self limiting, so called paroxysmal atrial fibrillation, or persistent if it doesn’t terminate. Investigation of Atrial Fibrillation (AF): Considerable effort is focussed initially on finding a cause so it can be prevented. Sometimes if paroxysmal atrial fibrillation is suspected, then ECG taping for 24 hours or more needs to be done to confirm its presence. This will depend on the particular type. For isolated episodes (called paroxysmal AF) sometimes no treatment is warranted. For more bothersome attacks, regular medication is tried. Radiofrequency ablation can be used for more curative action if medication is ineffective or causes side effects. For persisting atrial fibrillation where the disturbance is sustained, an electric shock (quite painless with very brief general anaesthetic) can normalise the heart rhythm. This is referred to as electrical cardioversion (see below). Once again, for recurring episodes of persisting atrial fibrillation, radiofrequency ablation should be considered. Some types of atrial fibrillation are longstanding or might be resistant to electrical shock. In some of these cases, it might be deemed as unnecessary or impossible to convert the rhythm back. This is so called “permanent atrial fibrillation”, and the mainstay of treatment is to control the heart rate instead. In many cases the only perceived risk of atrial fibrillation is that of stroke. This occurs when the irregular rhythm results in relative stagnation of blood flow in certain parts of the left atrium, causing clot to build up. If a small bit of clot dislodges, it can fly off into the brain. This is worrying and the potential risk of it occurring needs to be assessed. Where the risk of stroke is considered significant, blood thinning with either aspirin or warfarin would be considered. This is the procedure to restore normal heart rhythm by electrically jolting the heart. Patients are prepared in the following way: The blood is thinned with warfarin for at least 4 weeks to dissolve any potential clots that would be dislodged by the electric shock. 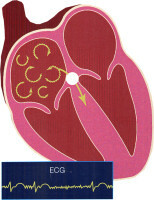 In some cases, the heart rhythm is stabilized electrically with a drug such as amiodarone for about three weeks. In this way when the electric shock is delivered there is a maximum chance of restoring a normal rhythm. For the actual procedure, the patient is fasted for 6 hours. The patient is very briefly aneasthetized and an electric shock delivered. Provided the patients are well selected, the overall success rate is about 80%. After the shock, the patient wakes up and can go home after about 4 hours. It is important that the patient remains on the existing medication for at least three weeks to prevent the risk of stroke, and to maximise the chance of success. This is a more regularised form of atrial fibrillation that conforms to a more defined circuit. The treatment principles are fairly similar to that of fibrillation.